By 1919, many of Europe's old institutions were damaged beyond repair. The Kaiser had been deposed, the Czar executed. The Ottoman and Austro-Hungarian empires ceased to exist. Millions of young men had lost their lives in the trenches across Europe, while others had died of the influenza pandemic. The old world was gone, never to return. 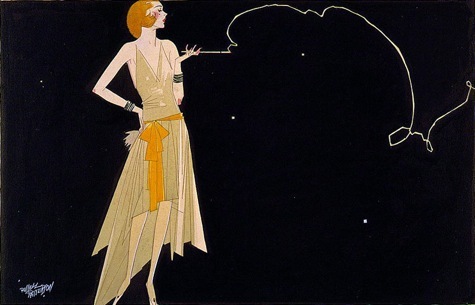 1920s fashion reflected the birth of a new, modern world. The new and changing styles of dress reflected the new popularity of films and the rise of modernist art. Almost all the old ideals were turned on their heads, from the ideal female silhouette to the sartorial markers of wealth. 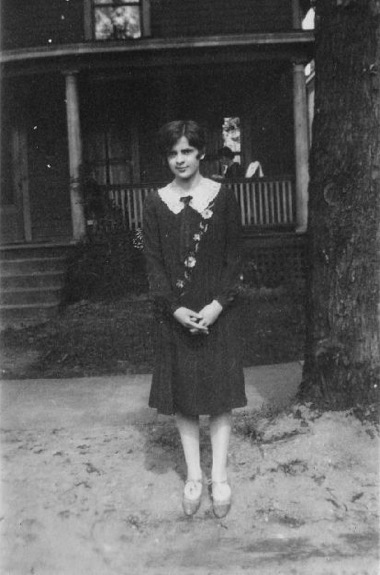 A young girl poses for the camera. Photo scanned by Infrogmation, taken 1925. After the horror of war, young people, and children, were seen as the future. Women's fashions became markedly childlike, even as they adopted the "secrets of the harem" into their toilette. Designers like Coco Chanel and Jean Patou, in some ways, created not just modern dress, but the modern woman. 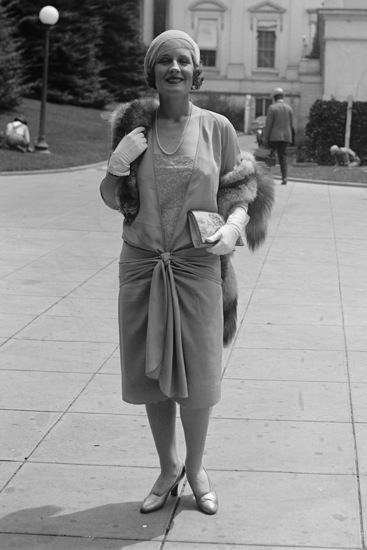 1920s fashion for women was almost the polar opposite of the old "Gibson girl" look. The popular "flapper dress" had a long, straight bodice, a dropped waist (or none at all) and a hemline at or just below the knee. Women de-emphasized their curves, often wearing girdles or special corsets that flattened the bust. It was during this period that the little black dress became a fashion staple. Coco Chanel, one of the preeminent fashion designers of the era, came up with the idea of the "Total Look." In the total look, individual clothing items were not so important as how an outfit was worn and accessorized. Since women were now showing their legs, stockings became a necessity. Some young women would roll their stockings down at or past their knees. While rayon stockings were more affordable than nylons, they were very shiny, leading women to powder their legs before going out. 1920s hairstyles marked a radical departure from past fashions. Women cut their hair short, often in a bob, and covered it with a cloche hat, an emblematic accessory of the era. However, throughout the decade, rumors flew that short hair was just about to go out of fashion––leading to brisk sale of wigs and hairpieces, just in case. It was in the 1920s that Mary Jane shoes were first popularized. Dress shoes with a Louis heel––a curved, medium-high heel––became popular as well. As the empires and aristocracies of the continent collapsed, people increasingly looked to film stars as role models, especially in matters of taste and dress. 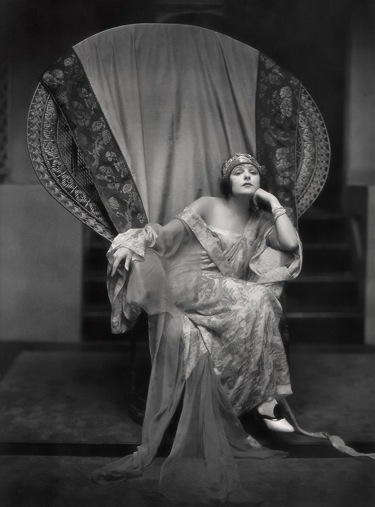 Film idols like Rudolph Valentino, Louise Brooks, Gloria Swanson and Pola Negri were discussed endlessly in the tabloids. Clara Bow in It , the movie that made her a star and coined the phrase "It Girl." Makeup became cheaper and more acceptable throughout the 1920s. The extravagant styles of the silver screen were inspirational. Women (and, probably, some men) tried to recreate the dramatic look of their favorite film stars. One half of this music, the melody, was all pomade and sugar and sentimentality. The other half was savage, temperamental and vigorous. Yet the two went artlessly well together and made a whole. It was the music of decline. There must have been such music in Rome under the later emperors. Compared with Bach and Mozart and real music it was, naturally, a miserable affair; but so was all our art, all our thought, all our makeshift culture in comparison with real culture. This music was at least sincere, unashamedly primitive and childishly happy. The radio, first used for entertainment in the 1920s, helped popularize jazz in America and Europe. The phonograph cylinder and gramophone record also made jazz music available to people who would never have heard it otherwise. Throughout the 1920s, jazz rose in popularity. Dance styles like the Charleston caught on, especially with young people. Prohibition and prosperity encouraged debauchery, and jazz seemed the perfect soundtrack to it. The 1920s saw the birth of hipsters, or white, middle-class youths who imitated black culture. The word was first coined by black jazz musicians, then used derisively to describe white fans. 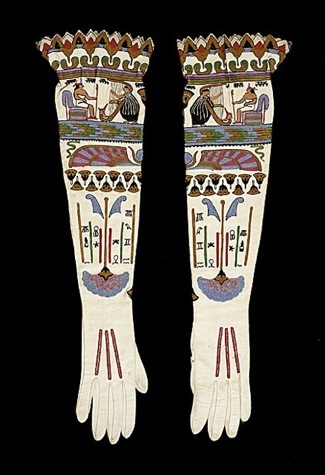 A pair of women's gloves with hieroglyphic motifs. From France, circa 1925. Photo from the LA County Museum of Art. In 1922, Howard Carter and George Herbert discovered King Tutankhamun's tomb, which was nearly intact. This discovery received worldwide press attention and led to a renewed interest in ancient Egypt. This renewed interest led many designer to adopt aspects of ancient Egyptian fashion into their own designs. Too, Egyptian motifs, such as the eye of horus, were also used, and adopted into the styles of the day. For most of the 19th century, light skin was an indicator of high status. Laborers worked out in the fields, in the sun, while wealthy people had the luxury to remain indoors. That changed definitively in the 1920s. After the industrial revolution, an increasingly large segment of the workforce made its living in offices or factories. People grew pale from lack of exposure to the sun. Rich people spent much leisure time playing or watching genteel sports, like tennis and golf. This marked the birth of the tan--or at least a healthy glow--as a marker of high status and desirability. Women no longer wore wide-brimmed hats to protect their pallor. Athletic activity also gained in popularity for the upper classes. The first sneaker was invented in 1917. These sneakers, "keds," got their name from the combination of the word "kids" with the Latin word "ped," for foot. Keds were used in the 1920s, though the apex of their popularity was not to come for 40 years. Return to Enjoy Your Style's vintage fashion section.